Four weeks later, the football cleat is on the other foot. Heading into Week 10, the Jets were 3-6 and hoping to climb back toward break-even ball with a home win while Buffalo came visiting with a 2-7, on a longer losing streak, down to its fourth quarterback. On Sunday the Jets go to Buffalo at 3-9 and on a six-game skid while the Bills, fired up by their 41-10 win over the Jets, have moved a game ahead to 4-8 and are the team now entertaining a longshot .500 finish. Despite the reversal of fortunes, Jets head coach Todd Bowles said his mission remains unchanged. "I think every week is personal for us, so the fact that they beat us pretty good, that stings as well, but last week against Tennessee stung, so we've just got to go out and play our game," Bowles said. "They know us well and we know them well. It's just a matter of going out and playing, keeping field position, and whoever makes the most mistakes will lose." An attraction in this one is the possibility of the first starting matchup this season between two of the four top-ten QB draft picks in the April draft (see points 2 and 3 below). With their MetLife victory last month, the Bills lead this original AFL rivalry 62-54 overall, with that advantage built on their 33-24 edge in games played in Buffalo, including wins in five of the last six. The Jets' most recent triumph at New Era was by 37-31 on Thursday night in 2016, built on Ryan Fitzpatrick's 374 passing yards and Eric Decker's and Brandon Marshall's 100-yard receiving games. Those names are long gone but among the returnees: Quincy Enunwa, who had six catches on six targets for 92 yards and five first downs. "Q" will be in the middle of the Jets' attempt to avenge last month's home loss at the place still lovingly known as "the Ralph." 2. Ball's Back in Sam's Court? It wasn't official Thursday but Jets rookie Sam Darnold could get back in harness after handing the reins to Josh McCown for three games due to his foot strain. The Buffalo defense figures to greet either Jets rudely, especially on passing downs, since despite sexier secondaries in Jacksonville and elsewhere, it's the Bills who are packing the No. 1 pass defense — the first time they've had the NFL's top-ranked passing D in any week since 2005. They also have the No. 2 overall defense in yards allowed/game, leading OC Jeremy Bates to observe: "They don't allow big plays, they're extremely sound, they're aggressive, they're strong, they're fast, you name it." The Jets defense faced Matt Barkley four games ago. Now it's time to see one of the top rookie QBs drafted along with Darnold. When Josh Allen, his elbow well again, pilots the Bills offense, it produces fewer points/game than Darnold's offense (15.3 to 19.7), punts at a far greater rate (53% of drives to 41%) but also turns the ball over less (10% of drives to 16%). And there is the run dimension as the 6'5", 240-pound Allen is No. 2 on the Bills with 389 rush yards behind LeSean McCoy. DC Kacy Rodgers on the dilemma: "If they block it up and max-protect, he can throw it about 80 yards. And if it isn't there, he can take off and outrun everybody that's chasing him." The Jets' pass defense might get a break facing a rookie QB and after Buffalo parted ways this week with veteran WRs Kelvin Benjamin and Andre Holmes, who totaled 334 catches and 35 TDs for their careers. But both were underperforming, and in the Week 10 win they combined for one catch and 22 yards. The WRs who scorched the Jets that day are still cooking — second-year man Zay Jones (eight catches, 93 yards, TD) and Robert Foster, whose 105 yards (on three catches) were the most vs. the Jets by a true rookie since Sammy Watkins and Martavis Bryant in 2014 and who's averaging a monster 32.0 yards on eight catches in his young career. The Jets got an earful for Sunday's season-high penalty performance — 13 penalties called against, 11 marked off for 96 yards — with three flags on the defense during the Titans' final drive going a long way toward costing them the win. But it may surprise fans to know that in this NFL season of near-record yellow-flag throwing, the Jets are lower-half offenders with 6.5 penalties/game (20th-most) and 49.4 yards/game (27th-most). And who might the worst lawbreakers be? The Bills are in the running for that title at 8.3 penalties/game (2nd) and 72.7 yards/game (2nd). Bills HC Sean McDermott: "We need to get that corrected. It's hard to win when you do that." Can't get enough of Jason Myers and Andre Roberts. 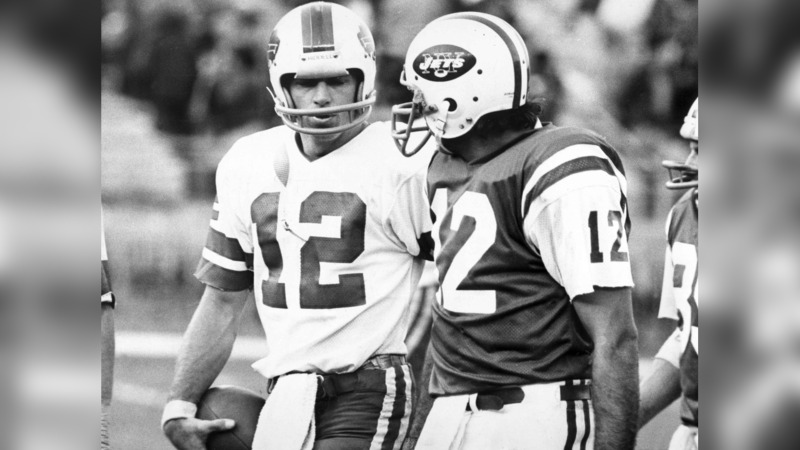 If Myers is good on his personal motto, "Start strong and finish stronger," he may set some more Jets season records, for most field goals (he's got 28, Jim Turner had 34 in 1968) and FG accuracy (he's at 93.3%, Nick Folk had 91.7% in 2013, but Northeast December weather beckons). He's already got the franchise season mark with 48 touchbacks. Roberts, meanwhile, added a 59-yard KO return at Tennessee, giving him four 50-yard punt/kickoff returns this season (no one else has more than two) and a league-leading 955 total KR yards. Myers and Roberts are the faces of Bowles' "field position" vs. the Bills. NFL teams don't often beat a division opponent on the road after getting beat at home by that opponent by 31 or more points. The only time the Jets ever did it was in 2002 vs. New England (44-7 loss in their home opener, 30-17 win at Gillette Stadium in Week 16). And the last time an NFL team repaid a bad home loss to a division foe with a good road win was the Titans in 2012 (41-7 home loss to the Texans in Week 7, 23-22 win at Houston in Week 17). The Jets' one lesson from these pairs of games should be that payback on the road is not easy and not common but it's doable.